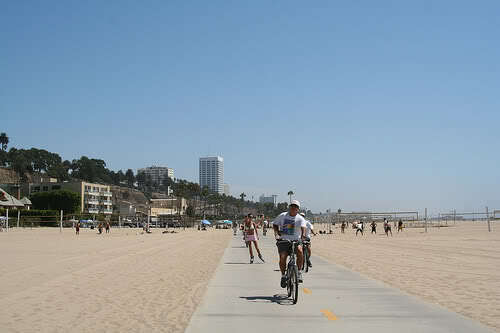 But west and north — at the Santa Monica Bay — you are treated to some of the most famous and “best” beaches in America. (Residents may argue Orange County beaches are better, but in the end it’s a matter of taste and difficult to quantify perfection.) You can find everything you need for a true California beach vacation here — hotels, resorts, restaurants — and “the good life” at its finest! Heading north from Palos Verde, the first beach you come to is Torrance Beach, which is physically like the beaches further north although not nearly as “fashionable” nor, it should be noted, as crowded. If you’re looking for an uncrowded pristine beach with all the amenities of its more famous cousins to the north – Malibu, Santa Monica, Venice, Manhattan Beach and so on – then you should definitely consider Torrance Beach. There are even stretches of beach here that are used for fishing. 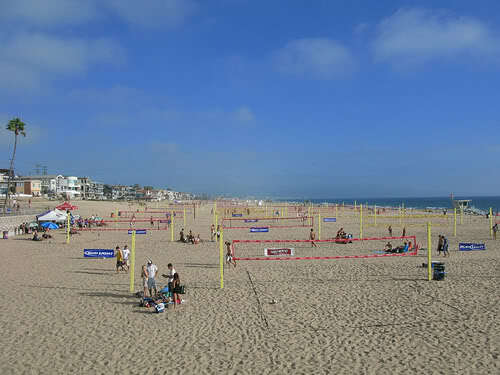 More often considered the gems of Los Angeles area beaches, however, are Manhattan Beach, Hermosa Beach and Redondo Beach. The sands are perfect, beach access is easy, amenities are close by and the on-beach activities available are world class. Between surfing, swimming, beach volleyball and strolling along The Strand (walkway), it is easy to enjoyably fill your day. These areas are casual and laid-back, so restaurants tend to cater to the beach goer. Accommodations range from beachfront hotels to incredible vacation rentals on The Strand. All three of these Los Angeles area beach towns have piers, and the restaurants, shops and traveler accommodations tend to be centered around them. Redondo tends to be a little more formal, especially around the marina area where you can find plenty of steakhouses and four-star hotels. North of Manhattan Beach is El Segundo, home of several oil refineries and beaches that are desolate for a reason: there’s nothing around and the air is foul. Best to steer clear here, unless you need serious solitude. The next beach north is near Los Angeles International Airport, and like El Segundo, it tends to be desolate except for the occasional intrepid surfer. Just north of the Marina del Rey inlet is Venice Beach, famous for rollerblading, muscle builders, cheap hotels, exotic people and the unconventional. Even though the beach itself is absolutely gorgeous, most people don’t come here for simple swimming. It’s “slink or swim” for the ladies and a parade of bravura for the men. Honestly, though, people-watching here is also a popular “sport,” and no trip to Los Angeles is complete without a few hours (at least) on Venice Beach. A bit further north is Santa Monica, home of aging starlets, residents who commute downtown on the Santa Monica Freeway, artisans, UCLA expats, etc. Near the Santa Monica pier, in the heart of downtown, you can find a cornucopia of tourist services and lovely beachside hotels, motels and cottages. The coast here is pure southern California beach (a lot like Newport Beach) for part of the way, and as you head north on the busy Rt. 1 you will zip past broad sandy beaches with vast parking lots. Once Rt. 1 leaves Santa Monica, the coast gets more mountainous and the beaches are just beaches, reachable only by car and supported by a restaurant here and there. You’ll see the occasional motel when some canyon road meets Rt. 1, but nothing of substance until you reach Malibu. Topanga State Beach, about halfway to Malibu, is the charming exception – and well worth a stop, especially if you’re interested in fishing. Malibu, of course, is largely the gated-home playground of the Hollywood set, with Pepperdine University and Malibu Canyon thrown in to keep things real. While most Malibu beaches are hard to reach (private homes block or restrict access), there are some great Malibu seaside restaurants and beachfront hotels, some of which provide at least a bit of access to the beach. At Zuma Beach, there’s a truly spectacular stretch of the coast, and it’s yours to enjoy if you’re willing to travel there by car. As you drive up the coast and leave the Los Angeles beaches behind, things thins out — dotted by the occasional state or county park — and head into Ventura County. You may want to stop there or continue on to “The American Riviera” of Santa Barbara’s lovely beaches. Photo of Manhattan Beach in Los Angeles by mbtrama via flickr (Creative Commons); Photo of Venice Beach in Los Angeles by caccamo via flickr (Creative Commons); and Photo of Malibu Beach in Los Angeles by tensaibuta via flickr (Creative Commons).